With all new Mr. Tenderizer (31269) enjoy hassle-free cooking sessions with minimal tasks involved while preparing meal. 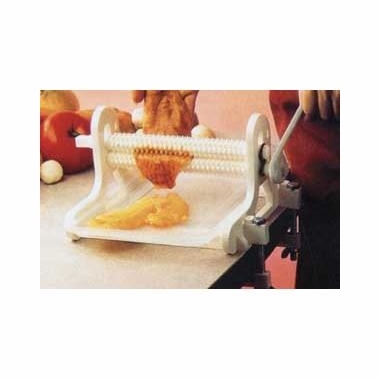 Mr. Tenderizer allows you to tenderize, flatten, and marinate, simultaneously. Gone are days of pounding or hammering, this kitchen meat tenderizer will add just the right touch to your meat, fish, venison or poultry without splattering it all over your cooking station! Mr. Tenderizer is an apt alternative for those chemical tenderizers. It will assist you in preparing scrumptious meal for your loved ones. The pyramid-shaped prods expertly penetrate the meat's surface allowing it to absorb seasonings, spices, and sauces deeply.